300 m² wellness area with whirlpool and panoramic sauna in the garden, new rooms with pine wood, in-house restaurant with bar – an oasis of tranquillity for hikers, motorcyclists & relaxation lovers! Welcome to the bed & breakfast Pension Elisabeth*** in Untermoi in Gadertal valley! The Bed & Breakfast Elisabeth*** is surrounded by green meadows at the foot of the characteristic Mt. Peitlerkofel, just above the picturesque mountain village of Untermoi. We give high importance to a familiar ambiance and offer cosy standard rooms as well as six new and lovingly furnished panoramic rooms mad of pine wood. 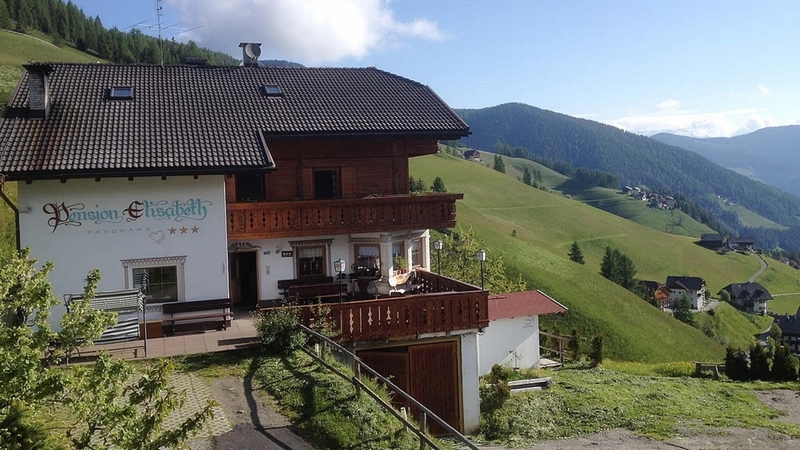 They are furnished with wooden floors, a bathroom, hairdryer, WLAN, safe, TV and balcony with view of the Dolomites. In the in-house restaurant with bar, you can enjoy regional specialities. Moreover, there is a recreation room, a characteristic Tyroelan lounge and a sun terrace. In our 300 m² wellness area, you can relax after a day spent in the mountains. We offer a panoramic hot whirlpool, a panoramic sauna in the garden, a steam bath as well as new relaxation room. Our house is ideal for yoga coachings too. Thanks to its ideal position, B&B Pension Elisabeth is the ideal starting point for hiking or biking tour in the Nature Parks Puez-Geisler and Fannes-Sennes-Prags. Bikers are welcome! Home made products, Deckchair, Ski depot in the house, Pets allowed, Snow boot dryer, above 1000 m a.s.l.